The Dallara IndyCar Factory is a joint venture between the IndyCar Experience and Dallara Automobili. 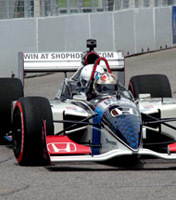 It is located just 1/3 of a mile southwest of the historic Indianapolis Motor Speedway - home of the Indianapolis 500 - and just 5 miles from Downtown Indianapolis - the Dallara IndyCar Factory is the destination for race-enthusiasts, and those who are brand new to the sport, to get their fill of all things IndyCar! The Dallara IndyCar Factory offers visitors the chance to explore 23,000 square feet of interactive and hands-on exhibits centered around the engineering and technology of the world’s fastest sport! Take a walk through a tunnel filled with IndyCar blueprints and design concept drawings or sit down and relax in our theater as you catch up on the history of Gian Paolo Dallara and his company, Dallara Automobili! Get the feel of what it’s like to race at the famous 2.5 mile oval when you sit behind the wheel of a racecar simulator and race using IRacing! Four times a day the door to the Dallara factory opens, and visitors get the chance to see where IndyCars are designed and produced.